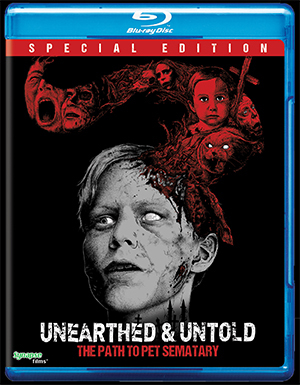 Synapse Films and Terror Films have teamed up to release the documentary Unearthed & Untold: The Path to Pet Sematary on Blu-ray. 1989 saw the release of the Stephen King adaptation, in a collaboration between the author and director Mary Lambert. Two filmmakers, John Campopiano and Justin White, spent nearly five years uncovering the story of the film, from its path to being a book, then a film, and finally garnering cult status. This is the most comprehensive look at the film, as well as a celebration of King's terror tale. It features interviews with the cast and crew, tours of the locations used in the film, and a look at the impact it has had on horror fans. It will be released for the first on on home video on March 13. You can pre-order it here. Check out the full list of special features below.